Truly unique, Global knives are the choice for chefs around the world. The sleek, seamless knives are constructed from a single piece of CROMOVA stainless steel to eliminate food traps and give you unmatched agility. 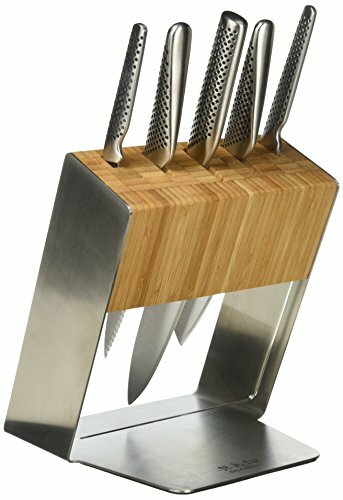 6-Piece Set Includes: 8" chef's knife. 5A1/2" nakiri vegetable knife. 4A1/4" utility knife. 6" serrated utility knife. 3" paring knife. Bamboo and stainless-steel block. Manufacturer: Global. Material: CROMOVA 18 stainless steel. Care: Hand wash and dry immediately. Warranty: Limited lifetime warranty. Made in Japan. FEATURES Lightweight to reduce hand fatigue. Perfectly balanced for more control. Ergonomic, molded handles. Global's signature dimple pattern provides a stronger grip. Edges are ground straight to a point rather than beveled for exceptional sharpness and edge-retention. Hollow handles are filled just enough to achieve the perfect weight. Chef's knife is ideal for chopping, slicing, dicing and mincing. Nakiri knife is designed for chopping and slicing vegetables. Serrated utility knife makes it easy to cut everything from sandwiches to citrus fruits. Utility knife is for small, precise cuts and slicing, dicing, peeling and mincing. Paring knife is ideal for small, fine cuts, peeling fruits and vegetables.